Coming back to the site though, I must apologise for my lack of regular activity on here. Its been a bit of a crazy ride with Get Cooking, and maybe its just the season, but we've been incredibly busy, especially after Kathryn was featured on the Edmonton Journal. Its winding down a bit though and much as I love my work, I am looking forward to the Christmas break. I promise to cook and bring to you a lot more recipes. In fact, I have drafts months old sitting in my folder that I haven't gotten round to taking pictures for, its that bad... and of course the waning daylight never helps either. I am still aiming to get four to six posts a month, though ocasionally they may err on the four side. Today's post is partly a review, and partly a walk down memory lane (yes, again!!). 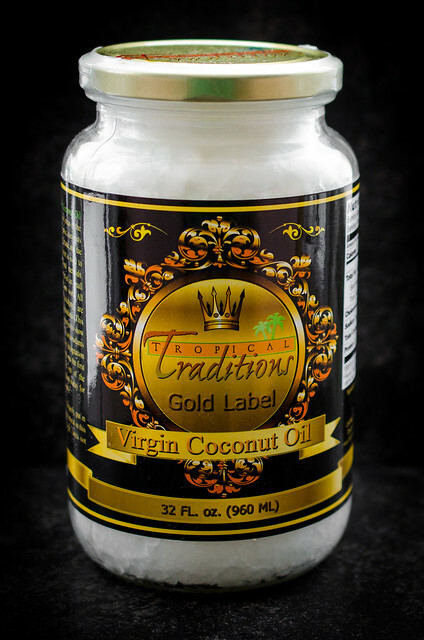 I was recently contacted by Tropical Traditions asking if I'd be willing to review their Tropical Traditions' Gold Label Virgin Coconut Oil, a certified organic coconut oil. My regular readers will know that I was born in the land of coconuts (aka, South India) and I use a lot of coconut oil in my cooking, especially when I am doing traditional recipes. So I was intrigued enough to say yes, and the oil duly arrived, well packaged and with minimum hassle. At the moment, coconut oil seems to be quite the rage and trendy too... but for me its always been a part of my everyday life back in India. I grew up on a small coconut orchard, and we had several prolific coconut trees that we relied on for many of our everyday uses. The coconut tree is usually referred to in Kannada as the 'Kalpavriksha' or the tree that sustains. Almost all parts of the tree are used, from the fruit to the leaves to the trunk, after it finally dies. I have spent many lazy and grumpyhappy summers having to work out in the garden, from lugging coconuts back into storage to cleaning up around the trees to stripping the leaves to get to the dry sticks from which brooms are made. Every morning and evening my dad would turn on the ancient pump that pumped out water from our well and water all the trees, while reading his newspaper and sipping tea. Coming back to the Tropical Traditions oil though, I was quite curious when I found out that their Gold Label oil was not made with copra but by an even older process. My first thought after opening up the oil was that it was definitely a purer white than the usual copra based oils I was used to. And the fragrance was slightly different too, a nuttier, more intense aroma. I tasted a little bit, and again, I was surprised at the intensity of taste. I had some of my usual coconut oil at hand too, to I checked out both side by side to make sure I wasn't imagining things, and I wasn't. The virgin coconut oil was very different to the copra based on. I wasn't sure whether I liked that much flavour intensity, to be completely honest, so I pulled out one of my mom's recipes where the major flavouring is coconut oil, and decided to do a full taste test. So, back to Christmas cooking, or the lack of herein. The recipe I am posting today is one of my mom's simplest ones. Its the one we fall back on after days of meat filled festivities. 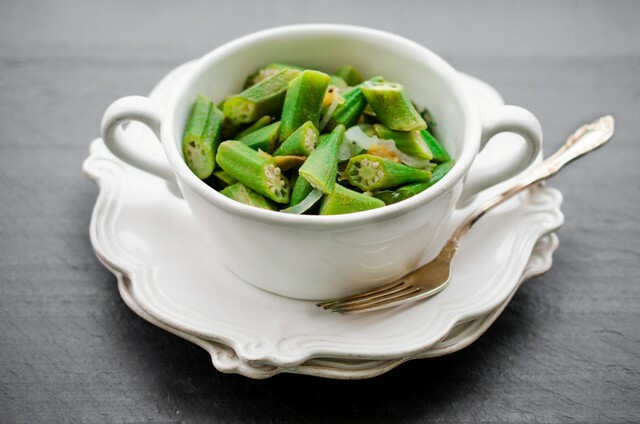 An easy on the eye, time and tummy, okra saute, quickly braised with onions, tomatoes and green chilles with a tempering of mustard seeds, coconut oil, curry leaves and garlic. Its fresh, light and most of all, delicious. I am always left wondering at how my mum can produce the most flavourful of dishes using the simplest of ingredients, and this recipe typifies her style of cooking to a tee. I was actually hugely surprised at how well the virgin coconut oil worked in this recipe. It added another flavour dimension to this simple recipe, and for a change I could actually taste the oil seasoning, which was not just intensely tasty, but also beautifully fragrant. I think I may have just found a new favourite brand of coconut oil, and its not my mums... eep... now how do I explain that? Wash and dry the okra. Slice the tops off, then cut into 1 inch pieces on the diagonal. Place the okra, the sliced onion and tomato and the green chilles in a pan, and add the water, adding a little extra until it just covers the vegetables. Season to taste with salt. 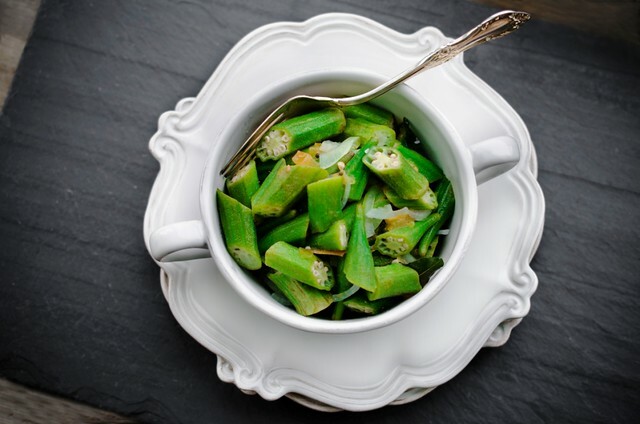 Bring to a boil, then turn down the heat and simmer gently for about 7 - 10 minutes, until the okra is tender. Take off the heat. In a small frying pan, heat the coconut oil, then add the mustard seeds, garlic clove and curry leaves. Fry for about 30 seconds, or until the seeds start to splutter. Pour over the oil seasoning on to the cooked okra, and cover. Stir well before serving. Can be served with rice or as a vegetable side dish with meats. Disclosure: Tropical Traditions provided me with a free sample of this product to review. I was under no obligation to review it if I so chose. All opinions are my own. The coconut oil sounds like a very interesting ingredient to try and I like the idea of using it in a simple dish to let the flavour come through. I still have more than a hint of okraphobia as a result of eating it in restaurants where the cooking wasn't perhaps as good as it should be. It's really easy to get okra wrong and I think I would definitely get it wrong. I obviously need okra therapy. 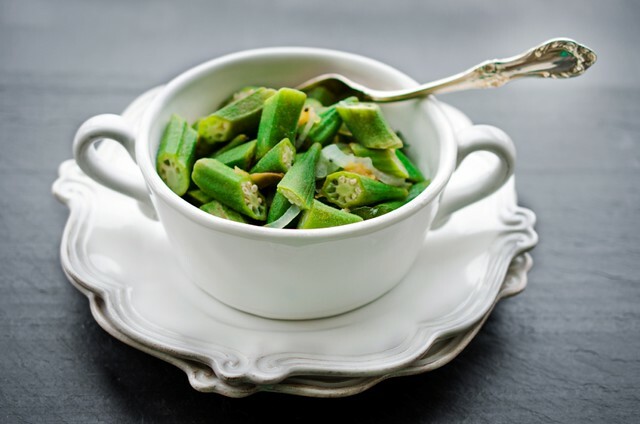 Okra doesn't get the attention it deserves. Thanks for highlighting this! I would love to have all my food in coconut oil. It is one of the best oil what i think. Always cheers for coco.